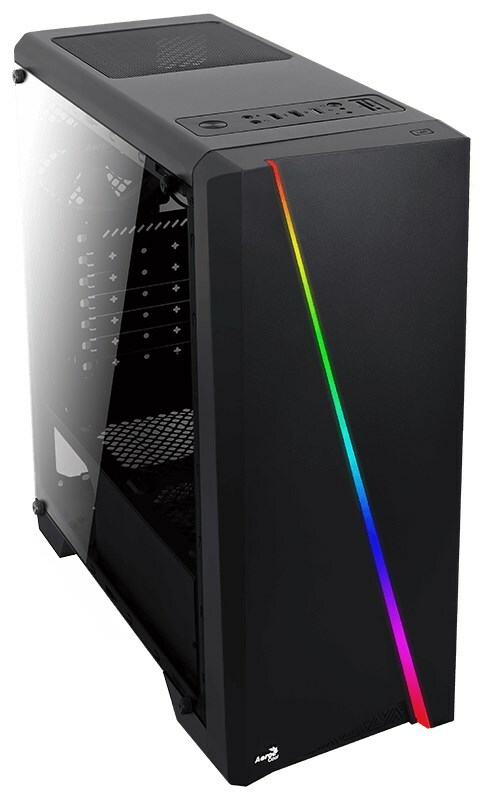 Aerocool introduces Cylon, a new mid-tower with a backslash RGB LED element in the front panel. The case measures 198mm x 459mm x 413mm, it's made from steel and weighs 3.8kg. It supports motherboards of up to ATX form factor, has two 2.5"/3.5" drive bays, two 2.5" drive bays, room for video cards of up to 371mm long (346mm with front fan), and CPU coolers of up to 155mm tall. Cooling is provided by up to seven 120mm fans, of which one is included with the case. Watercooling fans can mount a 240mm radiator in the front. You can check the full specs over here. Supports liquid cooling: 240mm radiator in the front panel. Supports graphic card cooling: two 120mm fans for superior cooling performance of VGA. Supports up to two 3.5” HDDs and two 2.5” HDDs/SSDs.